Has it really been a year since Aladdin first opened on the Great White Way? Time sure does fly now doesn't it? In the last seven or eight years I have written over twelve hundred blogs or more about shows both On and Off-Broadway as well as London and other cities around the world. Now in all those years my taste as far as what shows I like have definitely changed. Makes sense to me. After all as I get older things like what I want to see is not the same as it was when I first moved to New York over twenty-three years ago. What I can tell you is that no matter whether I liked it or hated it I always found something about it that entertained me. If only for a little while. So what does this have to do with Aladdin you ask? Well for those of you who have read any of my blogs over the years know that I am not exactly the biggest Disney fan in the world. In fact out of the eight musicals that Disney has produced over the years I have only seen three of them. Aida, Tarzan and The Little Mermaid. Now Aida I actually liked. Probably because it wasn't a cartoon first. As far as the other two are concerned let's just say that I stayed for the entire show and leave it at that. I know what you're thinking. He must really hate Disney right? That's not entirely true. I loved most if not all of the animated films when I was growing up. However them being on Broadway? Not so much. I guess I'm just a fan of original works. The thing is it really doesn't matter what I think. Disney is here to stay my friends and to be honest that is not a bad thing. I mean do you know that The Lion King is the highest grossing musical of all time with sales exceeding over a billion dollars?Not too bad for a show based on a cartoon. Plus that show along with every other show they have produced over the years have kept hundreds and hundreds of people employed. Not to mention it has kept people like me employed as well. After all if not for the Disney shows or other family friendly shows like Wicked or The Phantom of the Opera I may not have a job either. Now you don't want that to happen now do you? I didn't think so. O.K. O.K. I know I have rambled on long enough. After all you are probably reading this blog to get more info on Aladdin right? Now as the title says the show is a hit. A big hit in fact. However that doesn't mean you can't get tickets to see it. Believe it or not but there are tickets available. Not only that but we sell them. In fact we sell tickets to all the shows that I mentioned including other great shows for the whole family like Les Miserables, Matilda and this season's newest hit Finding Neverland. Oh and don't forget such Off-Broadway staples like Blue Man Group and Stomp. That's what is so great about theatre in New York. There is something for everyone. Even for a guy like me. So what are you waiting for people? 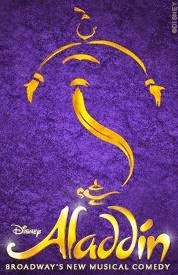 Get your tickets to see Aladdin on Broadway. Better yet just come to New York and see a show. Live theatre. There is nothing like it.